Above art by the great Joe Busam! Join us on the road at these great conventions, shows and events, sure to interest classic horror film fans! Meet your friends (Monster Boomers) from Creepy Classics at a show coming to your neighborhood soon! Print, save and mark your calendar! Events listed chronilogically. CINEMA WASTELAND - Holiday Inn, Strongsville, OH. April 5-7, 2019. Check the CinemaWasteland Site for details. 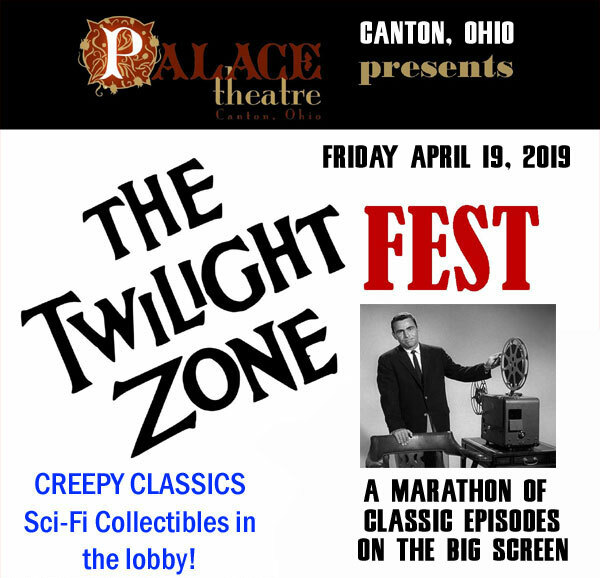 THE TWILIGHT ZONE FEST - The Palace Theatre, Canton, OH. April 19, 2019. 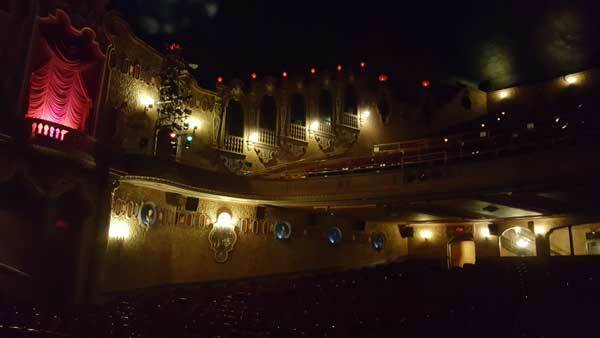 A marathon of classic Twilight Zone episodes on one of the biggest movie screens in Ohio! Marathon starts at 7:30PM...get ready for a night in The Zone. 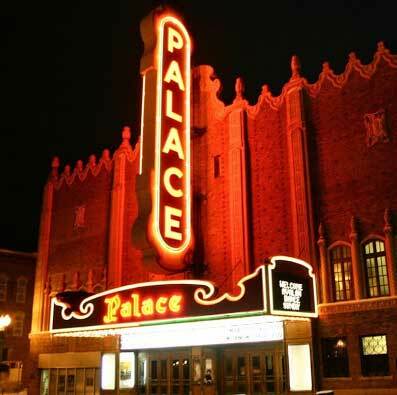 Check the Palace Theatre site for details. Creepy Classics/Monster Bash Set-Up in the lobby! Hotel: Canton Grand McKinley, only a few blocks from the theatre. CHILLER THEATRE - Hilton, Parsippany, NJ, April 26-28, 2019. Check the Chiller Theatre web site. The biggest of Monster Shows in country! Not to be missed!! 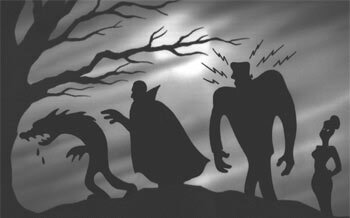 APRIL GHOUL'S MONSTER RAMA - Riverside Drive-In, Vandergrift, PA. April 26-27, 2019. Here's their site - CLICK HERE. We'll see you there for two nights of terror!!! CINEVENT - Columbus, OH, Memorial Day Weekend, 2019 - Renaissance Hotel Columbus Downtown. Check the Cinevent web site. A laid back great show that focuses on the black and white classic films of our past. WONDERFEST - June 1-2, 2019 - Crowne Plaza Airport Expo Center, Louisville. Check the Wonderfest web site. WonderFest is a weekend of hobby escape that’s held every Summer in Louisville, Kentucky USA! Now in its 30th year, WonderFest features movie special effects guests, the largest model contest in the U.S. for sci-fi, horror & comics-related subjects, model and toy dealers galore, and seminars to entertain and improve hobbyists of all ages! Guests include: Ricou Browning, Ginger Stanley, Caroline Munro, Martine Beswick, Veronica Carlson, Christopher Neame, Tom Savini, John Russo, Ohio TV Horror Host Son of Ghoul and more. The host hotel is the Doubletree Pittsbugh North (724) 776-6900. The alternative hotels that are booking up with Monster Bash attendees: The Comfort Inn (right across the parking lot) (724) 772-2700, The Super 8 (right across the parking lot) (724) 776-9700. Also filling for Monster Bash, Red Roof Inn (724) 776-5670, Hampton Inn (724) 776-1000, Motel 6 (724) 776-4333, Holiday Inn (724) 772-9766, Fairfield Inn (724) 772-0600, Residence Inn (724) 779-1000, Marriott (724) 772-3700 (expensive, but nice), Hyatt (724) 779-7900 (expensive, but nice), Hilton Garden (724) 779-9999. 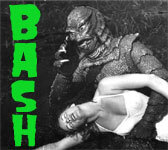 Keep updated on the MONSTER BASH web site! Call for info at (724) 238-4317. 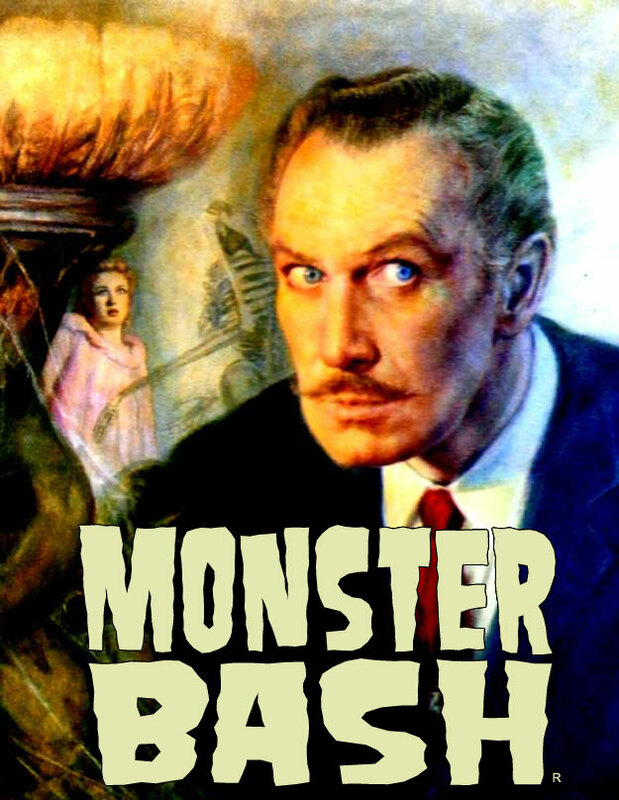 MONSTER BASH VINCENT PRICE FILM FESTIVAL & EXPO - The Canton Palace Theatre, Canton, Ohio. August 16-17, 2019. 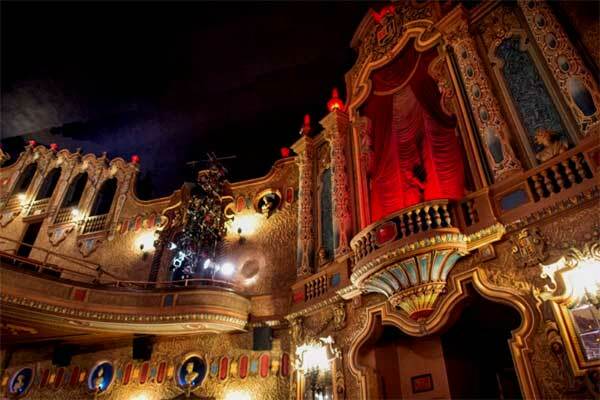 Our Movie Marathon show at one of the most AMAZING, glamorous movie palaces in this country - The Historic Palace Theatre, Canton, Ohio. Special guest speaker: Vince Price's daughter, Victoria. Vendors and shopping on breaks and intermissions. Special guest TV's Son of Ghoul horror movie host. The Classic Monster Experience of a Lifetime. 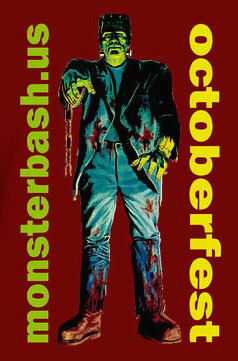 We will be screening a marathon of classic monster movies on one of the biggest screens in the state of Ohio. 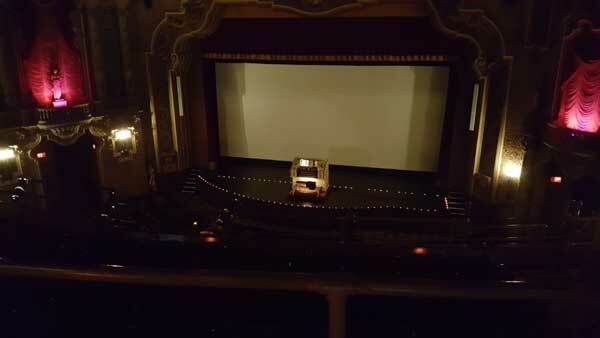 The massive theatre seats about 1600 with a beautiful balcony. A big mezzanine area will feature the best of Monster Bash vendors. 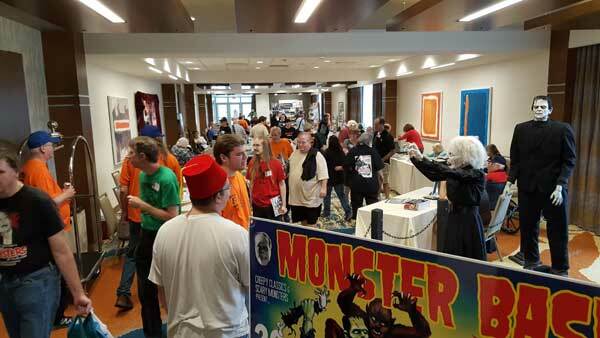 Creepy Classics (Monster Bash Headquarters) will fill the lobby with props and thousands of classic monster DVDs, Blu-Rays, Collectibles, T-Shirts, Monster Magazines and more. 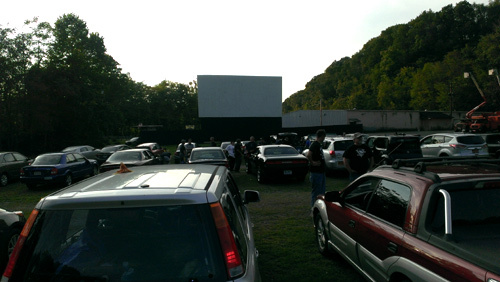 DVD DRIVE-IN SUPER MONSTER RAMA - September 6-8, 2019: Riverside Drive-In, Vandergrift, PA. Details upcoming for the next show. Keep checking back for updates. Here's their site - CLICK HERE. We'll see you there for two nights of terror!!! MID-ATLANTIC NOSTALGIA CONVENTION - Marriot, Hunt Valley, MD. September 12-14, 2019. Check the Mid-Atlantic Nostalgia Convention Web Site for details. MONSTERAMA - ATLANTA - Atlanta Marriott, Alpharetta, GA. September 27-29, 2019. 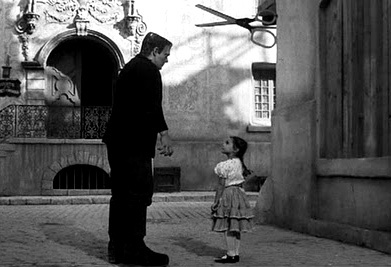 Check the Monsterama Web Site for details. CINEMA WASTELAND - Holiday Inn, Strongsville, OH. October 4-6, 2019. GHOULARDIFEST - Cuyahoga County Fairgrounds Expo Center, Middleburg Heights, Ohio, October 11-13, 2019. Dedicated to the memory of TV Legend - Ghoulardi. Lots of vendors and fun entertainment! 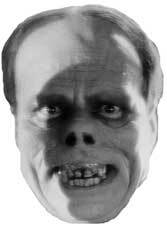 CLICK HERE for the GhoulardiFest Web Site. 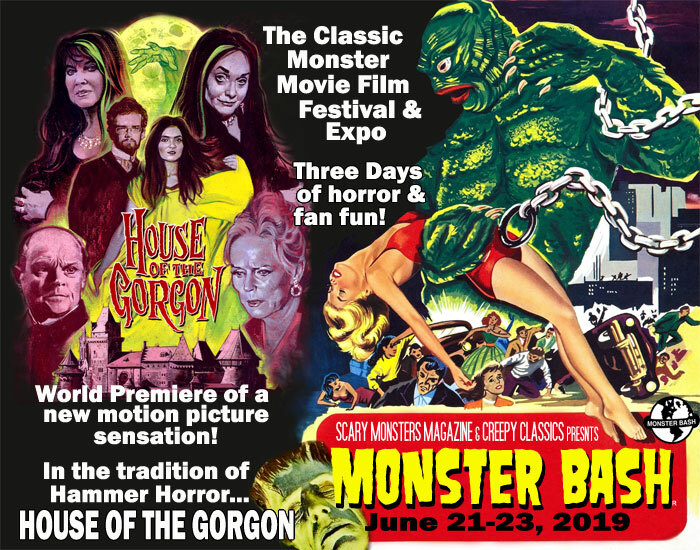 The Classic Monster Movie Conference and Film Festival. Guests include Mark Goddard (LOST IN SPACE), Marta Kristen (LOST IN SPACE), Donnie Dunagan (SON OF FRANKENSTEIN), Janet Ann Gallow (GHOST OF FRANKENSTEIN), Son of Ghoul (Cleveland TV Horror Host). Friday evening it’s Mexican Monster Night with free tacos and burritos while supplies last. Free giant sheet cakes served on Saturday night. More BIG details coming soon. Rooms are going quick! The host hotel is the Marriott (724) 772-3700. Keep updated on the MONSTER BASH web site! Call for info at (724) 238-4317. CHILLER THEATRE - Parsippany, NJ, October 25-27, 2018. Check the Chiller Theatre web site. The biggest of Monster Shows in country! Not to be missed! !